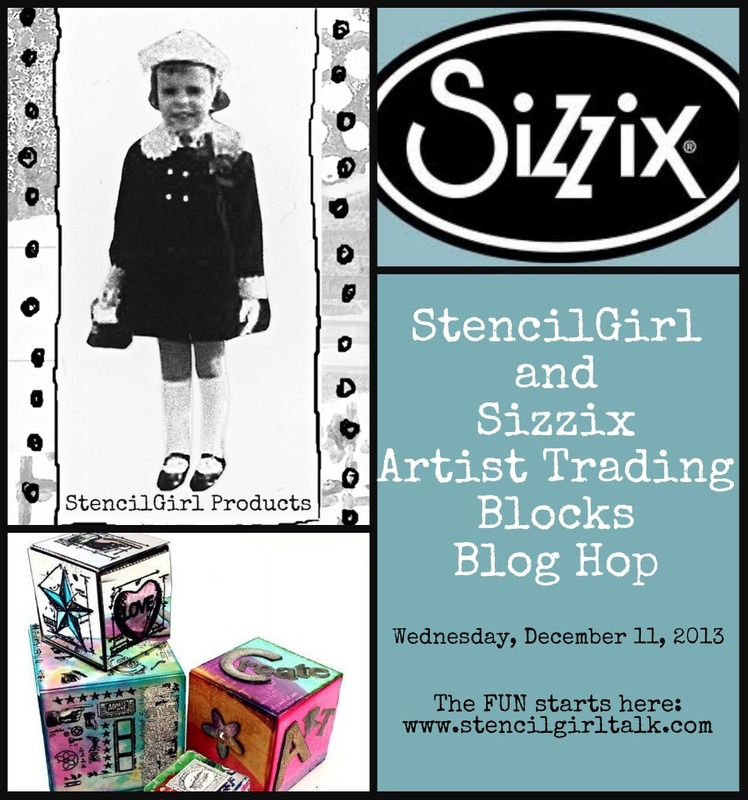 Sizzix and Stencil Girl Products have teamed up! The next big thing since Artist Trading Cards!!! 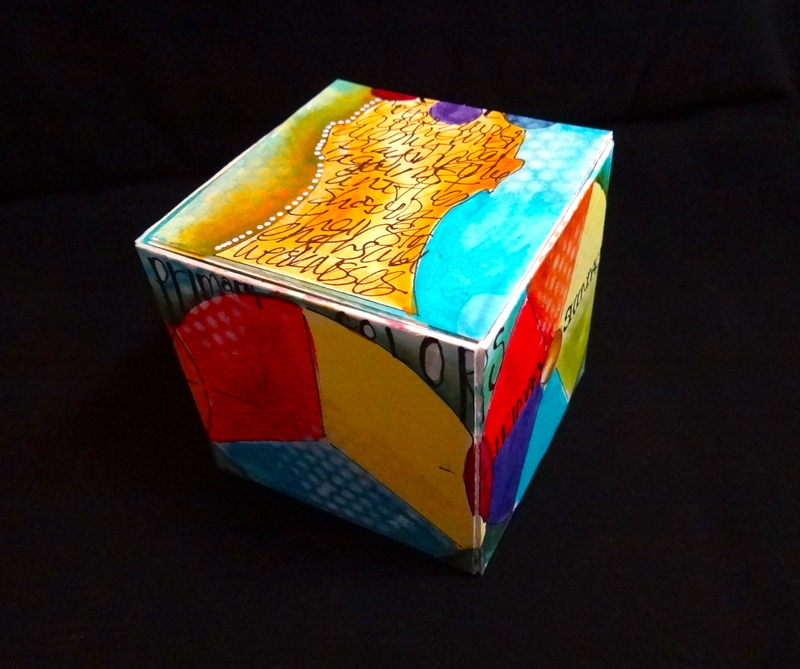 Unlike Tags and ATC’s Artist trading blocks (ATB’s) allow you to create in 3-D! Why show only one side of your creativity when you can express yourself with multidimensional style? With Eileen Hull’s (soon to be released) Scoreboards Block dies you can showcase your creative side inside and out on an ATB! Check out The Artists on the Block website! These are so unbelievably cool!!! 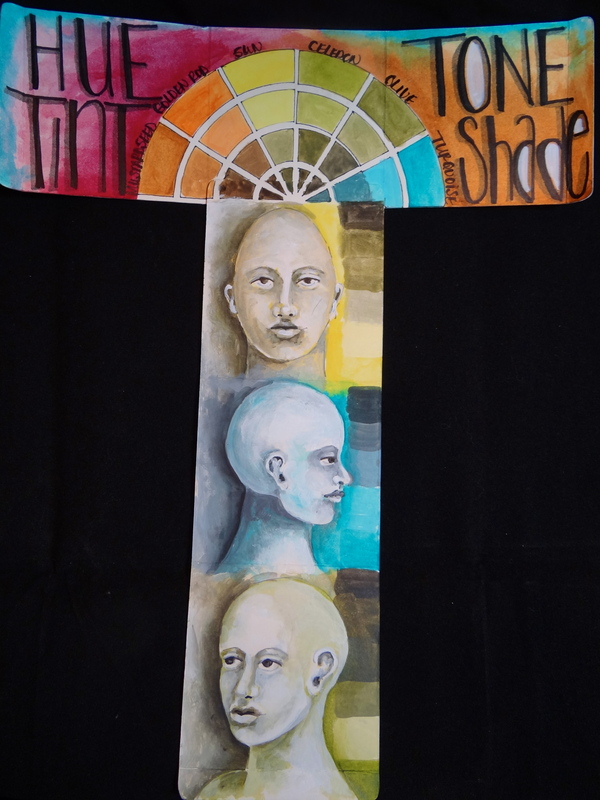 I had so much fun creating an ‘Art Tool’ out of my block, with a focus on Color Theory. 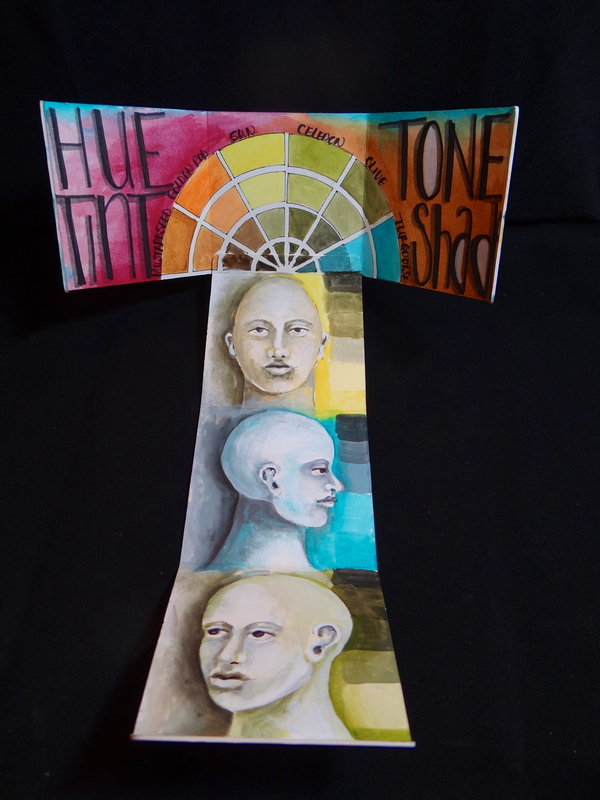 I used my Color Wheel Stencils and my ATC sized Face/Mask stencils to create a block based off of one of my workshops, “The Real hUe”. 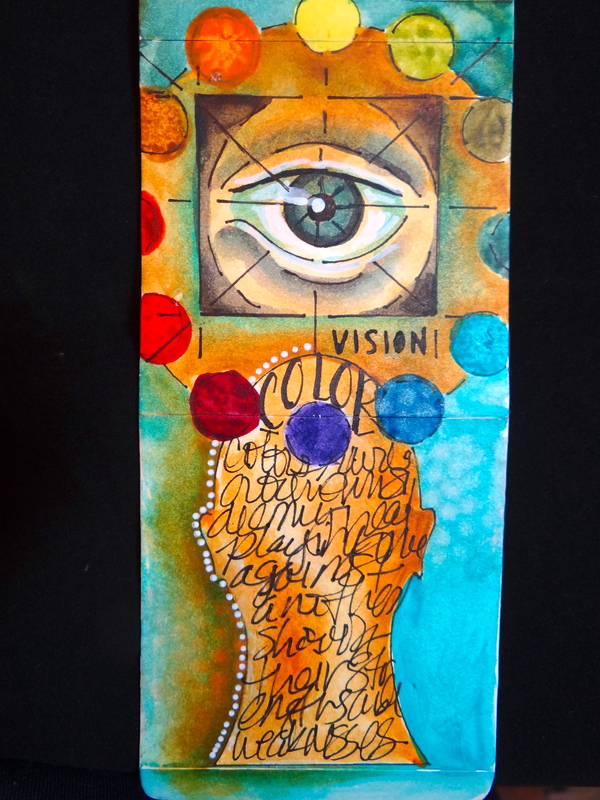 On this side of the block I used my Journal Sense Vision 4×4 stencil and one of the Simple Color Wheel stencils. The fun thing here is the lines from the Vision stencil help link color combinations like, complementary, triad, split complementary, analogous and tetrads. Love it when things just happen to work like this! On the inside of the box I put the Hue Tint Tone Shade color wheel to use and created mini one hue portraits using my ATC sized Face/Masks stencils. And what would any Artist Trading Block need to finish it off but a signature block! When you’re all done creating the whole thing folds up into a cute little cube. Really fun and I can’t wait until the die is available so I can make more!! This is a progressive hop meaning that you will hop from blog to blog all in one day. From here you’ll visit Carolyn Dube next. There’s a giveaway on StencilGirl Talk consisting of SG product. All comments on the hop are eligible for the giveaway. The more blogs they comment on, the more chances they have to win. Feel free to tell your viewers this. GIveaway will close on Friday, December 13th at 11:59PM Central Time. If you decide you would like to also have a giveaway on your blog please let me know and I will advertise it along with our promotions. HERE is the link to the Artist on the Block FB page and HERE is the link to the StencilGirl website. 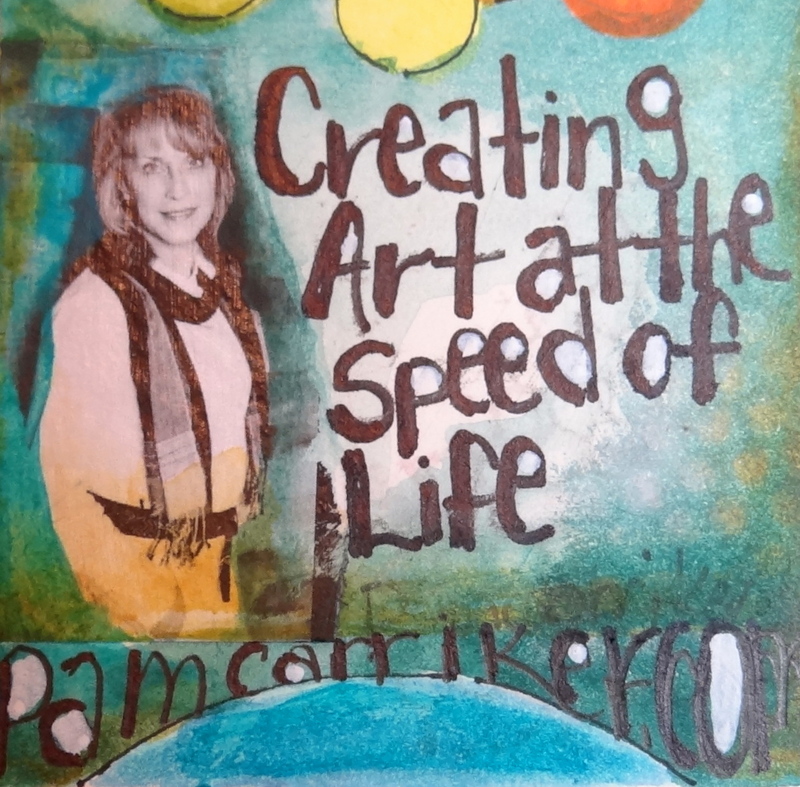 great sample of your artwork Pam. every creation and idea of yours is gorgeous. Wow! Gorgeous, and the inside is just as beautiful as the outside, so much meaning in the project too! So cool and fun! Love your work and style! Another awesome example of your artistry. You never cease to inspire! What a great project. Like the eye and the heads. Pam, I love your style! Great block I like how you did the inside as well and the colors really pop! Beautifully inspirational! Thank you for sharing with all of us! Love the block, new yet *you! * Can’t wait to try one myself. Every time I look at this I find something new. Great use of the space to convey a concept. I thought that the way that you used the colour wheel stencil was very clever, particularly the way the stencil linked together on each side of the block. 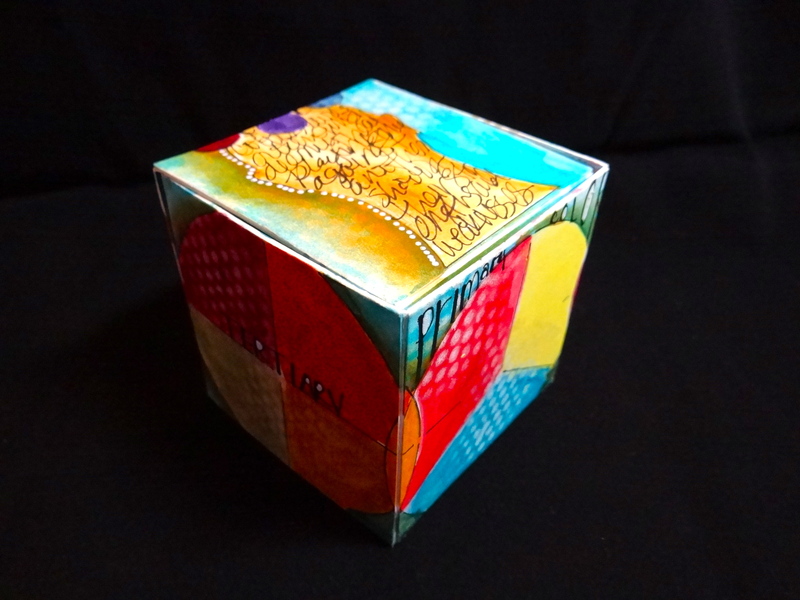 I really love the way that you have used the colour wheel stencil on your block and the way that it all linked together. Decorating the inside of the block was an interesting idea too, a great surprise when the block is assembled and then reopened. Your ATB is truly unique and I love it, Pam! Your colors and designs are wonderful! I love it!!!! I love your ATB! All of your beautiful colors and designs. Fab! 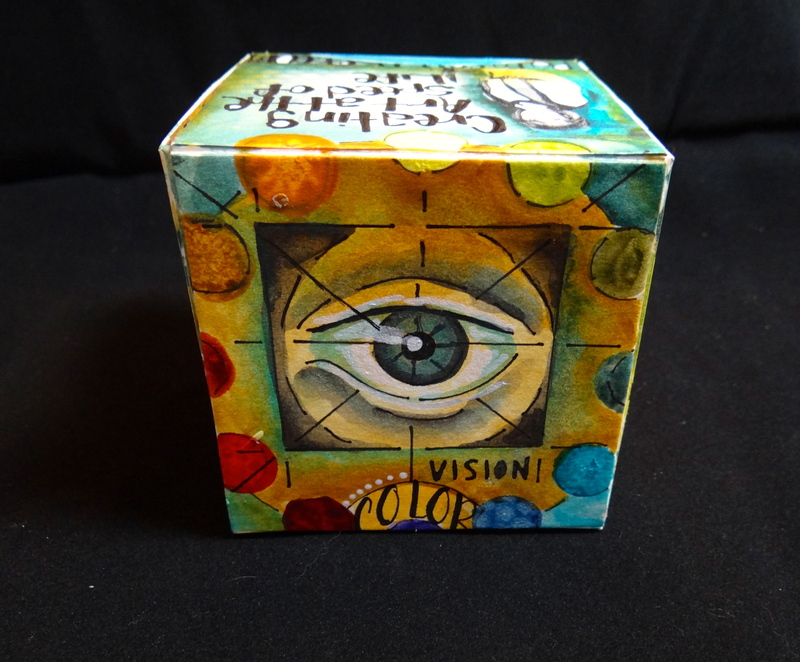 Great color wheel block! Thanks for the tutorial. Love seeing each artist’s signature voice in these blocks. I love, love, love Sarah’s idea of using the blocks like a mini journal. I’m going to hang on to that thought. I have two of your face stencils, Pam, and love them! so much to see on every surface..I love it! WOW!! Amazing love what you did with the Blocks!! I love your use of stencils to create your theme!!! Great stencils and an awesome die to play with. Absolutely gorgeous!! Love how you used all your stencils…. the coloring AND colors are fab! Simply gorgeous and perfect in every way! Love the way the workshop info was incorporated onto the block! Fantastic!! What grand fun this would be!!!!!!!!!! Amazing. Amazing. really. And I love the inside, too. Just…amazing! Bold colors and ideas. this is a great idea – blocks give you lots of room to play but not so much that you are intimidated. thanks for sharing. Beautiful! I love how you did both sides! Gorgeous block. Can’t wait to try one. Wow, Pam, so beautifully done (and not just in theory)! Fabulous! I love the signature block! Very lovely block. What a fun idea to play with. Love your blocks! But then love your art. OMG Pam! You Art Block is truly amazing. I can’t wait for the fabulous ATC block dies to be released & of course I will have to get one of your gorgeous ATC sized Face/Masks stencils to use right along side it. Love your eye stencil and the faces of yours. Looks great on the block. So wonderful! I love your block! And this is such a cool die! So rich and full of beauty. I just love your work Pam and would buy this block from you if it were for sale! Totally, totally you Pam. These are so rich with color and style. I have to pull my nose back from the computer screen…just trying to see each little bit of detail! LOVE it! I love your block. The colours are great. Fantabulous block! A small head above the rest! 🙂 Thank you for sharing! Loving everything about these, Pam. Gorgeous! I love your personal imagery inside and outside the box. It is stunning! You definitely knocked this one out of the park, Pam! I was hoping you’d use your stencil designs on your ATB! I love, love, love your design!!! So darn clever to turn it into a Color Block. LOVE it! Pam- wow- you totally rocked the block here! There are are so many things I love about your style- color, form and composition- you have them all. I even got a tutorial on color theory, all on one little blcok! Just beautiful (and even better in person :-))! Thanks so much for coming out to play and hop! Absolutely LOVE this… amazing ATB! I love that there are words everywhere, and the colours are just fabulous! Oh my stars Pam for the love of color THIS is jaw dropping amazing! Your stenciling skills are unmatched! I feel like your vision stencil can see into my creative soul. Don’t even get me started on the INSIDe…wow! To top it off your signature side is such an inspiration…the whole project is undeniably inspiring inside and out! 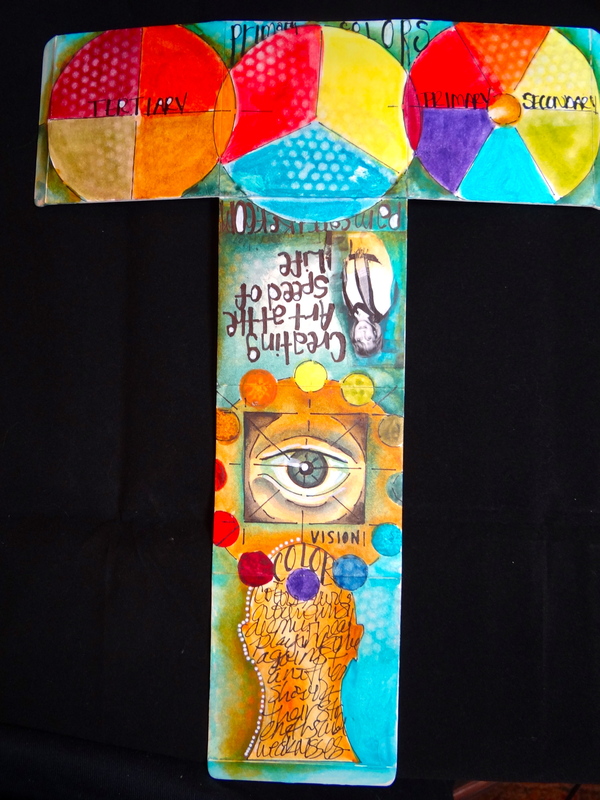 I love the art you used on your block Pam- such a cool idea the block is! Love it!